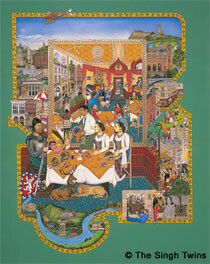 Wirral based, London born twin sisters Amrit and Rabindra are contemporary British artists of International standing whose award winning paintings have been acknowledged as constituting a unique genre in British Art and for initiating a new movement in the revival of the Indian miniature tradition within modern art practice. Describing their work as Past – Modern (as opposed to Post Modern), their work engages with important areas of critical debate – challenging existing stereotypes and redefining generally accepted, narrow perceptions of heritage and identity in art and society. Combining elements from Western and Eastern aesthetics they assert the value of traditional and non European art forms to the continuing development of Contemporary Art practice – exploring cultural, social and political issues of global significance within a highly decorative, often witty and symbolic style which has universal appeal and transcends cultural barriers. With paintings in private and public collections world wide the Singh Twins continue to be invited to speak on their work at institutions such as the Tate Gallery, London; The Art Gallery of Ontario, Canada; The National Museum of Modern Art in Delhi and Mumbai; the University of California, Santa Barbara and the Asian Art Museum, San Francisco. At the same time a significant interest from academics, individual art students and University research graduates has resulted in their work being incorporated into the Open University syllabus and other sectors of Britain’s formal education system. Two fine art books, Twin Perspectives and Worlds A-Part have been published on their work. In addition they are profiled in numerous main stream arts journals and publications including the Penguin History of Scotland, The Oxford History of Art:Portraiture, The National Portrait Gallery’s The Portraiture Now and Marg Publication’s New Insights into Sikh Art. Attracting International media attention, Radio and Television appearances include interviews for BBC’s Womens’ Hour, Mid Week, Front Row and Belief; CBC’s Here And Now and the Granada TV documentary Singh Out Sisters. An independently commissioned Arts Council film about their work, ‘Alone Together’, received ‘The Best Film on Art’ prize at the 2001 Asolo International Film Festival. In the same year they were short-listed for the Asian Women of Achievement Awards (in the category of Arts & Culture) and in 2002 were appointed official Artists in Residence to the Manchester Commonwealth Games. The work they produced in response to the Games gained international publicity and was featured as a question on the popular TV quiz show Who Wants to Be A Millionaire? In 2002 their Arts Council England, British Council and Air Indian sponsored solo India tour was launched at the National Gallery of Modern Art, New Delhi – making them the only British artists (besides Henry Moore) to have been offered a solo show at this, one of India’s foremost venues for Contemporary Art. In 2003 their work toured USA and Canada and they currently have works on loan to the Smithsonian Institute Washington. In 2005 a major retrospective of the vast body of work they have created since 1987 was hosted by one of Britain’s prestigious National Galleries, The Walker, in their home city of Liverpool. Future plans include a South Pacific tour of their work including New Zealand, Australia, Singapore & Thailand. 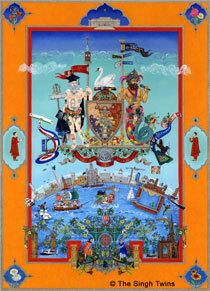 In 2006 The Singh Twins were commissioned by Liverpool Culture Company to create two paintings for permanent public display to celebrate Liverpool’s 800th birthday and its status as European Capital of Culture in 2008. 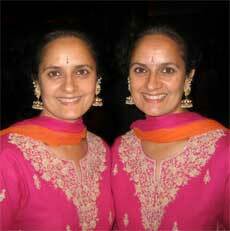 The Singh Twins are also published authors and film makers. Their writing includes books such as Bindhu’s Weddings and Images of Freedom as well as numerous articles for magazines, journals and websites both in the UK and abroad. In 2006 they completed their first film, Nineteen Eighty-Four and the Via Dolorosa Project – a short documentary on the making of one of their most famous works, Nineteen Eighty Four, which has been screened at film festivals internationally. Our art and collaborative partnership developed largely in response to the serious criticisms we faced during our first degree for pursuing common interests and goals in developing personal styles which were not only deemed to be unacceptable because of their similarity, but because they were ‘inappropriately’ rooted in Eastern cultural aesthetics and our experience as British Asians. Against this hostility our determined exploration of the Indian miniature style and established practice of working and exhibiting together (as well as dressing identically), is a political statement against the hypocrisy of an establishment which advocated self expression as the ‘be all and end all’ of Modern Art, yet denied the validity of anything which did not comply with the expectations dictated by a selective, Eurocentric perspective. Whilst asserting the right to define our own cultural and artistic ‘individuality’ in a way that is meaningful and true to who we are as British Asians, artists and twins our work, more importantly, redresses the need to re evaluate established cultural definitions, values and role models within the wider context of an evolving global society dominated by western consumer markets and popular culture. This is because ultimately, our artistic strategy is defined by a sense of responsibility to look beyond personal issues of identity towards exposing wider cultural prejudices and highlighting other concerns of more global significance. The desire to make a real difference through our work has fuelled our determination in establishing an international profile that demands acceptance on our own terms – creating a recognised platform for serious debate which has meaningful impact in challenging pervading social, political and cultural attitudes.